Everyone likes to look at young babies. But who wants to listen? Well…it turns out that other babies do. 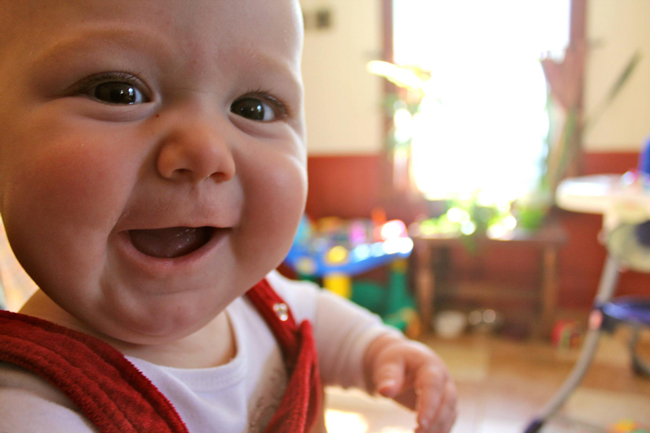 In fact, a McGill/UQAM research team has discovered that six-month-old infants appear to be much more interested in listening to other babies than they are in listening to adults. It is an important finding because the researchers believe that an attraction to infant speech sounds may help to kick start and support the crucial processes involved in learning how to talk. The discovery could also potentially offer new avenues to help infants with problems such as hearing impairment that hinder the development of their language skills. The researchers discovered this preference on the part of young infants by doing a series of experiments where they played a repeating vowel sound that mimicked either those made by an adult woman or those made by a baby. The sounds were created using a special synthesis tool. By measuring how long each sound held the infants’ attention, the researchers discovered that the babies had a clear preference for the sounds that mimicked the infant. On average, the infants listened to the infant vowels almost forty-percent longer than the adult woman vowels. This is not a preference for a familiar sound because the babies who took part in the experiment were not yet babbling themselves, so the infant-like vowel sounds that they heard were not yet part of their everyday listening experience. Some babies showed their interest in other ways. They met the adult vowel sounds with fairly neutral, passive faces. But when they heard infant-like sounds, they would smile or move their mouths as they listened, or do both. They seemed to recognize that this was a sound that they could try to make themselves, even though they probably had never heard anything like it before. Caregivers may already know this on an intuitive level. “Perhaps, when we use a high, infant-like voice pitch to speak to our babies, we are actually preparing them to perceive their own voice,” suggests Prof. Linda Polka, of McGill’s School of Communication Disorders, and the senior author on the study. This study brings researchers closer to an understanding of the complex interplay between speech perception and speech production in young infants.